Venezuelan Politics and Human Rights, a blog hosted by the Washington Office on Latin America (WOLA), is a unique resource for journalists, policymakers, scholars, activists and others interested in understanding Venezuelan politics and human rights. The contributors call it as they see it, providing insights on Venezuela’s politics that go beyond the polarized pro-Chavismo/anti-Chavismo debate. The views expressed in the posts are those of the authors and do not necessarily reflect WOLA’s institutional positions. David Smilde, curator of the blog, is a WOLA Senior Fellow and the Charles A. and Leo M. Favrot Professor of Human Relations at Tulane University. He has lived in or worked on Venezuela since 1992. He is co-editor of Venezuela's Bolivarian Democracy: Participation, Politics and Culture under Chávez (Duke 2011). Geoff Ramsey is WOLA’s Associate for Venezuela. He is an avid observer of the situation in Venezuela—having helped coordinate WOLA’s response to and coverage of the December 2015 legislative elections from Caracas—as well as a regular contributor to WOLA’s Venezuelan Politics and Human Rights blog. WOLA is a leading research and advocacy organization advancing human rights in the Americas. This week Reuters published the March* results of Venezuela’s leading pollster showing that Nicolas Maduro support had dropped from 33.1% in February to 26.8% in March, with 71.5% disapproving of him as president. This seems to represent a slow return to Maduro’s pre-legislative election levels in the low to mid-twenties. It is normal that presidential approval surges in the last days before an electoral event as the population polarizes vis-à-vis the electoral options. Waivering voters are forced to decide between options they find unsatisfactory. This is usually quickly followed by a “regression to the mean,” i.e. a return to previous levels. This time around, electoral polarization lasted longer than usual as the existential threat to Chavismo never subsided, with an opposition National Assembly taking office in January and confronting the government. However, the March numbers do show declining support. 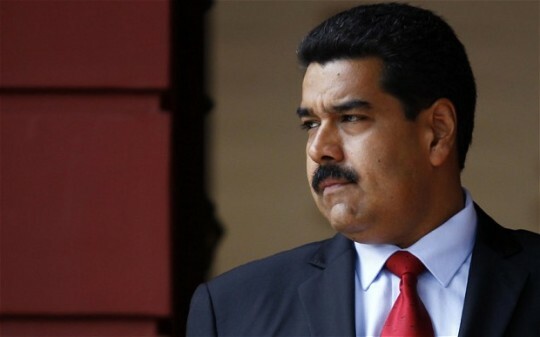 Over two thirds say Maduro should be relieved of his duties as president in 2016. 57.3% said they would vote against Maduro in a recall referendum, up five points from the month before. Digging further in to the poll we can see what is behind some of these numbers. 92.5% of respondents negatively evaluate conditions in the country. In 2012, the last time Hugo Chávez Frias was elected president, on average 38% of respondents answered negatively to this question. Over fifty percent of respondents say scarcities and inflation are the most important problems in the country (52.8%), compared to 11.5% who say crime and violence are the most important problems in the country. In Venezuela, presidents generally are blamed for economic problems, but not problems with crime. So having people point to the former negatively impacts presidential popularity. Over 80% of respondents say they have been affected by a scarcity of medicines. The Maduro government suggests such shortages are the result of an “economic war” being waged against its government by domestic and international capitalists. However, only around 20% of respondents blame an economic war. Around 75% point to some aspect of government policies. The government fairs somewhat better with the electricity crisis. Approximately half of respondents (52.6%) suggest the problem is with maintenance of the electrical system. 30.5% accept the government’s contention that it is the result of the El Niño weather pattern. 12.2% suggest it is because of excessive use by the population. Datanálisis’ February poll showed some further trouble for the government—the population overwhelmingly agrees with several of the opposition’s most important initiatives. 75.8% of respondents were in agreement with the proposal to give property titles to the beneficiaries of Misión Vivienda, including 71% of those identifying with the government. 83.2% were in agreement with the plan to expand pensioner benefits, including 83.9% of government supporters. When Datanálisis asked people who had voted for opposition candidates if they would do so again. 94% said yes. When those who had voted for pro-government candidates were asked the same question, 78% said yes. The poll has good news for the opposition coalition. Through mid-March the Mesa de la Unidad Democrática faired quite well, with 53.8% support compared to the Partido Socialista which had 26.5%. Perhaps the most striking number in the poll is that National Assembly president Henry Ramos Allup is Venezuela’s most popular politician with 55.2% support and 16.4% net positive (subtracting his negatives from his positives). This is surprising because many (of us) thought Ramos Allup’s image as an old time, pre-Chávez politician, was unrecoverable. This compares with Leopoldo López who has 51% and 13.4% positive and Henrique Capriles with 50.2% support and 6.3% net positive rating. 39.5% of respondents identify with with the opposition. 27.3% identify with the government. However, when asked about concrete parties, the gap narrows considerably with 26.4% identifying with the opposition and 23.3% with a pro-government party. Incredibly, Datanálisis has found a question in which a consensus emerges. When they ask respondents what they think the relationship between the National Assembly and the government will be like this year, 90.7% suggest it will be one of confrontation. When they ask what type of relation they would like to see, 93.6% say “cooperation” including 93.1% of government supporters, 93.7% of government opponents, and 94% of independents. *In Venezuela, automated telephone polls are considered too imprecise for accurate measurement. Thus polling is done through laborious fieldwork and normally takes weeks to carryout and tabulate. Results are often released six to eight weeks after the fieldwork was done. For comments related to this blog, email us at [email protected] For press inquiries only, please email us at [email protected] or call (202) 797-2171.